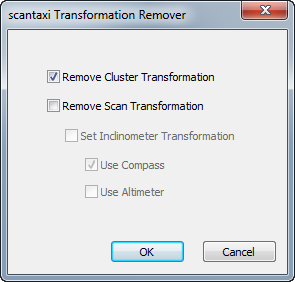 Transformation Remover easily “removes” the transformation data from clusters and other objects (mathematical correct: sets the transformation matrix to identity matrix). this transformation can be reset to the inclinometer data. This APP is suited for testing registrations without setting projects back to the last revision. This APP was developed on community request. Please take into account, that software development is expensive (even for small tools like this APP)! If you want to support our efforts, you may consider to buy some scantaxi scan-coins or any other scantaxi APP in the FARO 3D App Center!